Fans of the Hobbit by J.R.R. Tolkien and the trilogy of Hobbit films by Peter Jackson can now wear their favorite Hobbit gear all year round! We are pleased to offer a number of Hobbit-themed sweatshirts, Hobbit jackets, and Hobbit hoodies featuring many popular characters, including Bilbo Baggins, Thorin, Smaug, Bard the Bowman, and Azog the Defiler. Other hooded sweatshirts display scenes and lines from the films, the Hobbit logo, and stylized Hobbit images. Many of these long-sleeved sweatshirts and jackets have hoods and front pockets. Pick out your favorites to wear, or give these Hobbit hoodies to any Middle-earth enthusiast you know! 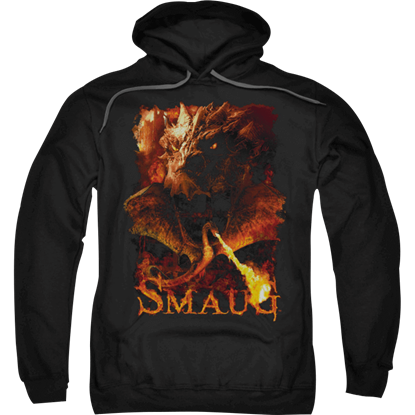 Exemplifying the magnificent terror Smaug is known to incite, the Smaug Smolder Hoodie features an eye-catching image of the main antagonist in the Hobbit storyline, a terrifically greedy and fearsome dragon named Smaug. Thank you so much, so very pleased with my order. LOVE the hoodies ! As always you guys never dissappoint.